I bought a box of this ammo to try. Indoor range, 50 and then 100 yards. 4 head shots, 2 dead center at 100, 1 in the 9 ring, 1 in the 8 ring. The other 16 were into the middle of the target, 10 in the bulls eye and 6 in the 9 ring. Pretty accurate, shot very clean (I was surprised by that part). Buying two boxes this time. I will update with a new review. OVERALL A VERY GOOD BULLET FOR THE PRICE. I RELOAD MOST OF MY FOOD FOR MY GUNS SO IT IS HARD TO BEAT HOME COOKING. LUCKY GUNNER IS A GREAT STORE TO DO YOUR SHOPPING AT. A+. Great Service, arrived quickly in good shape by UPS. Can't beat the price or service. Have not used the ammo yet will post another review after I have fired a few. I have nothing but good things to say about LuckyGunner. Easy ordering with a great selection makes it a top website. Delivery was quick. Had the order in a few days. I will be doing more business with LuckyGunner in the near future. I have been using PMC brand ammo for two years now, among other brands. 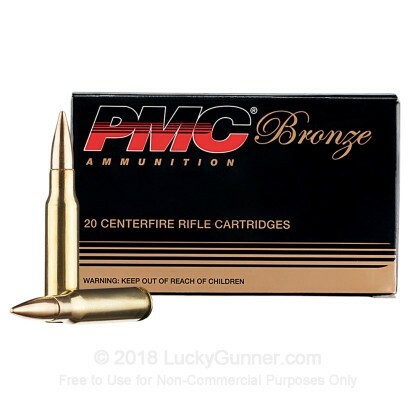 PMC is a great value and I have fired at least three-hundred rounds of .PMC .308 ammo through my rifle without resulting problems. I would also recommend PMC for your 9mm, .45, and 5.56/.223 as well. Put a couple boxes through my M1A this morning. It shoots better than I do. Great groups and no issues in my DPMS .308. Service as usual was great and delivery fast!! First time purchasing and shooting 308 ammunition. I bought it due to the price, and didn't expect much but was very pleased with the results. Ammunition was a little dirty and made it a little tougher to clean out of my PTR91 but all in all it was a great product at a reasonable price. I would recommend this ammo to others. Fired 80 rounds down range. First at 50 yards in order to sight in my new PTR91 KFM4R and then moved to 100 yards. Rounds were grouped at 1.5 MOA! Ammo in stock, readily available is huge in these unstable, and overtly political times for us law abiding gun owners. These rounds fire great through my AR10 platform and have had no problems. Having a great company like Lucky Gunner to step up and provide top notch products at great prices and backed by prompt service and fast shipping is what will keep me and plenty of my friends coming back to buy... again and again. 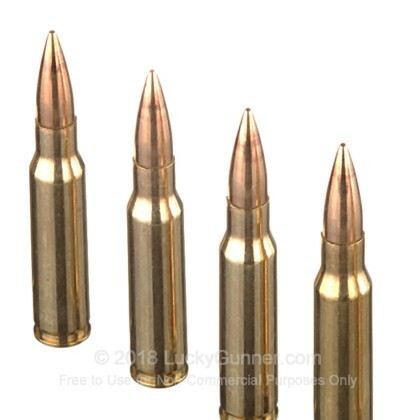 The ammo is great shoots fantastic, no problems. 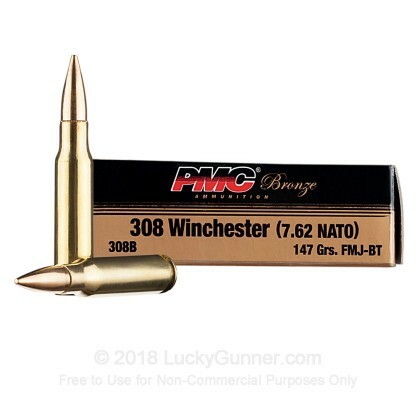 Only downside is the Ammo for a 308 is on the lighter side so at distance you will loose some accuracy, but for the price and the quick delivery lucky gunner provides you can not find a deal like a luckygunner deal. Lucky-gunner has hit the right spot with their prices!! Fine ammo at a price that was right (at least these days). Lucky Gunner is the best for getting orders out-the-door and on my floor. No problems. Less $$ than elsewhere. Pleased. I've run over 100 rounds through my Remington 700 with no failures. Easy to order and delivered on time. Great quality at a good price. I was surprised to see a value in ammunition still available. I will buy my ammo here from now on. I bought this just as target ammo. .308 is hard to find especially cheaper ammo. This was both affordable and shot well. Quality brass and reliable trajectory. Fired 150 rounds - no issues. Fast, fast fast delivery and great price. What could be better. Great plinking round. For the price, you get what you pay for and more. Shot 200+ rounds of this so far and no issues with the rounds themselves. You can find this at a number of sites, but Lucky Gunner had the best rates for the places I buy from. I like how they give you an option of shipping services. I prefer UPS in my area, and I wasn't forced to go with FedEx. I typically have my purchases shipped to a different address than my billing address. A rep from the site called me directly to verify that this was not fraud. I value that little extra effort they put in to protect me. Ran 20 rounds through a brand new R25 with no issues. Saving the empties to reload,looks like decent brass. Ran 100 rounds though my Sig 716 with Magpul mags, iron sights at short 25 yrd range. No malfunctions. Clean, reliable accurate. Will buy again. Ran a few hundred rounds through my RRA .308 and it functioned flawlessly. I recently purchased CBC garbage and if failed to feed and extract almost every other round. This pmc ran relatively clean with no hang ups. Love lucky gunners prices and shipping, what a great site. Great service and finally a company that has what i need for my rifles. Delivered when mentioned, and a perfect website, easy to find items..If they don't have what you need they won't show it on there site like many do..but when they do get them in, it's on there site ready for people to purchase..I like the way they do there business, wish everyone would do the same..
Bought PMC .308 for a new AR-10. Wanted it primarily for deer hunting and figured if it is accurate and reliable enough for that purpose it will also fill the bill for home protection. Fired about 20 rounds for sight-in. The ammo shot 1 inch groups at 40 yards from a makeshift bench rest; never failed to go boom. On opening day of deer hunting in Minnesota I had one shot opportunity at a walking buck at about 40 yards through the trees. The bullet did its job, dropping the buck after a 30 yead run. For what I needed it to do, it got the job done. And, the price is considerably lower than the big name brands. Fast shipping, two day turn around from time order was placed and at my front door. I did find the same ammo a little cheaper at another site but it took them 48 hours to place order and to ship it, and it will still be another 5 days for it to get here. Plus I only saved .37 per box (20) arrived in good shape. this ammo shoots great in my CETME, and it is a NATO round. I will order again from lucky gunner and not from that other site. Great Ammo and Great Price!! My Remington 700 SPS Tactical loves this ammo. I was able to make sub moa shots at 100 yards all day with this ammo. It out shot the American Eagle's heavier bullets. Great price too. my local gun shop sales it for $20 plus 9% sales tax per box. Lucky Gunner sales it for less and no tax. Haha..... can't get any better. I would give LuckyGunner 6 stars if they can pay for shipping to California too. Haha..... I ask too much!! Clean burning, fires every time, excellent ammunition. PMC has proven to fire every time. Clean burning and feels consistent in loading from round to round. Best part of Lucky Gunner is no email after purchase "item back ordered" they won't post if it isn't in stock!!! Good price, in stock, no complaints at all. Earned a repeat customer. Very pleased. Excellent customer service and fast shipping. Great product. Fires clean and accurate. Fired numerous times at the range, Accurate at 300 yds. Performed well for sighting in my rifle an out to approximately 300 yards. Better than I expected. Great value on this ammo. All my rounds were touching at the 300 yd shot groups. Got this ammo for target shooting. Works great clean never a miss fire. Brass is great for re loading very clean. 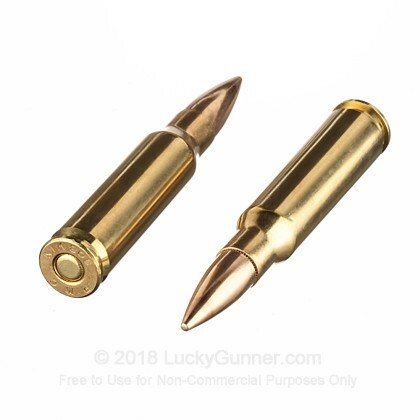 I buy all my ammo from Lucky Gunner price is fair what they have is what you get FAST, package is great shipping very fast. After an extensive search for ammunition to break in a newly purchased M1A NM, I settled on this ammunition for a couple of reasons. The price was very competitive compared with any other newly manufactured ammunition that I was able to find, and figured prominently in my decision. Also, I had read somewhere that it was produced in South Korea to exact NATO specs and therefor probably would have thicker walled brass , and so would help ensure the reload-ability, since I had been told that brass ejection on the M1A was particularly brutal for a semi-auto. I purchased 100 rounds, but wished I'd purchased more, since it shot very well at 100 and 200 yards, and the brass seemed to stand up reasonably well to ejection. My only negative, would be that it definitely seemed to shoot on the dirtier side, but overall, I will definitely look to buy more of this when and if it becomes available again. It was a pleasure to do business with the Lucky Gunner. Fast service, a fantastic product at a great price. I will be back for more! This is great ammo to train with. Never a missfire just consistent performance and I am keeping the shells for reloading. I just wish it was cheaper. 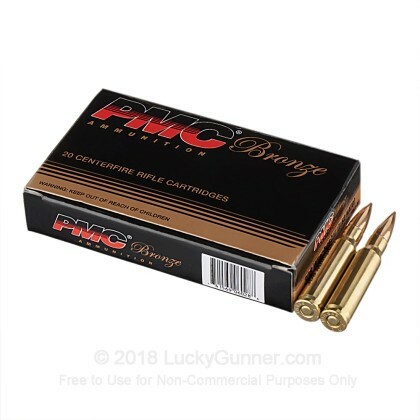 I am used to spend 30 cents per round and paying about double with this PMC ammo is making me twinge, but it is great ammo to have on hand between reloading sessions. Definately going to order more. Have ran about 100 rds of my 500 ordered, my SCAR 17s loves it, more accurate than i expected. Will be ordering more in the future. Great price, worth every pennie. I've shot over 1,000 rounds without no problem ! Excellent service, great training ammo. I have fired 500 rounds through my LTOBR. It is not FGMM but it is what it is. Not a hick up. Great service! We also have this 308 - 147 Grain FMJ-BT - PMC - 500 Rounds ammo in stock in a bigger quantity.